Graphic Novel (Guest) Review 343/365: Constance & Nano: Engineering Adventure! 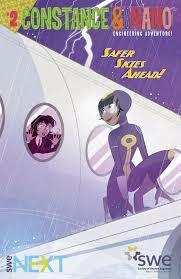 Issue #2: Safer Skies Ahead! Continuing the guest reviews of my esteemed Comic Book Teacher friends, I present to you an amazing chunk of graphic novel reviews by my main man Jason Nisavic. Jason is a Social Studies teacher in my district. He has used graphic novels to great success in his classroom, he runs our school’s improv team, and he also heads the Gay/Straight Alliance; I tell you this because Jason is a busy dude, so I appreciate it when he comes through with some top-notch reviews! Title: Constance & Nano: Engineering Adventure! Issue #2: Safer Skies Ahead! In an earlier review, Eric highlighted Jim McClaine’s Solution Squad as a useful graphic resource to getting kids interested in math. Beyond engaging young people in adventurous mathematical thinking, McClaine’s work helps level the playing field in a simple way; his very capable superhero team is mostly women. STEM is vital to unlocking the future, and it’s long past time to finish tearing down the boundaries that keep bright female minds out of the game. Enter the breath of fresh air that is Constance & Nano, an uplifting and simple adventure that features two female protagonists exploring the everyday marvels of engineering! In issue #2 (I couldn’t get my hands on #1 at C2E2, but I’d like to!) we are journeying with Constance on an airplane, when lightning strikes the fuselage! What happens next is a sincere, entry-level lesson on the ways in which planes are designed to handle disaster. The information that is presented in this issue is basic, colorful and engaging. It’s just enough to spark interest but not enough to overstay its welcome. Avenues are presented for readers who want to learn more. My only real (nitpicky) critique is that more space could have been devoted to the technology described in the issue, such as the ramjet. Beyond that, the SWE is doing a great service in spreading the word to kids about what an engineering career can do! Get free digital copies here!